Learn which colors work together to make stunning, colorful pieces! Need a refresher in color? You're in the right place! This kit has the perfect resources to conduct multiple color exercizes. You'll learn which colors work best together, and you'll be able to incorporate your new found knowledge into desiging your next project! In any medium, color is the key to successful crafting. The right color combination can take a project from good to spectacular, whereas a poor combination can waste time and materials with disappointing results. The great news is that “color sense” can be learned! 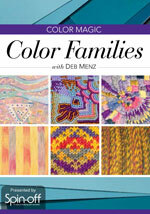 In this video, master colorist and crafter Deb Menz introduces you to the family traits of colors. What is a “warm” blue? How does yellow affect everything around it, and how can you use that to your advantage? What if you can’t find the exact color of yarn, fabric, or beads that you want? How can you design or substitute with confidence? Composing colors is like making music: sometimes your composition calls for thunderous drama and sometimes you want quiet harmony. And like every good musician, you need to know your “instrument,” the palette of colors available in your medium. In this video, master colorist and crafter Deb Menz explains how to compose with colors in a variety of mediums to create just the mood and impression you want. We all love color-its boundless array of hues dazzles our eyes, expresses our moods, and enriches our very lives. 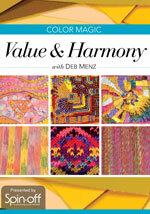 Thanks to Deb Menz, master teacher and author of the highly respected book Color in Spinning, you can now explore colors with confidence in whatever craft medium you call your favorite. 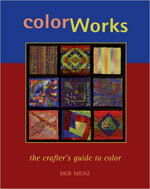 This is the first book to bring the principles of color theory down to a practical level and apply them to knitting, spinning, weaving, surface design (including stenciling and rubber stamping), hand- and machine-embroidery, beadwork, quilting, and paper collage. You will get 314 different colors of 2x3 paper in this set. Create different color combinations easily. This color tool makes finding color combinations easy. Start with your desired color card, choose one of the color scheme options, and then find the corresponding companion color cards to create the perfect color combination.